After being courted by Manchester United and most recently Manchester City, the combination with the up and coming Euro 2012 match against England has gotten Daniele De Rossi of Roma & Italy to talk a little bit about what might be his future move to the English Premier League. For De Rossi, 28, who recently signed a contract extension with AS Roma, there seems to be little doubt which is the better league; the more interesting league for him. I have received many offers from English football. And I must say that I feel attraction for it. I like English football very much. I think now it’s probably more interesting than Italian football. There are lots of outstanding and talented players, as is the case for Spain as well. De Rossi is the highest paid Italian player in the Serie A, signing a five year deal paying him €10 million a year, breaking the previous record, owned by Francesco Totti. 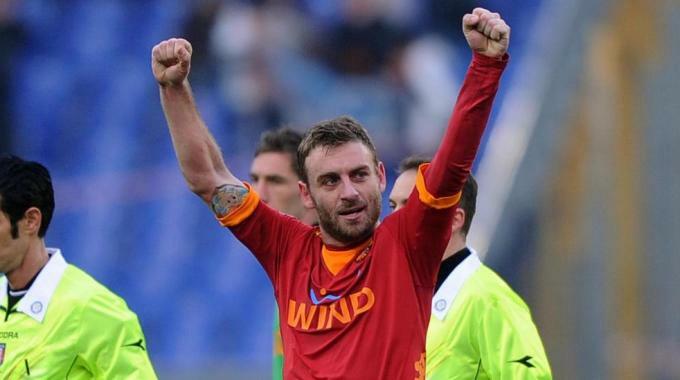 However, it seems that the last couple of seasons, since the 2010 World Cup, haven’t been all roses for De Rossi. Roma have failed to obtain a Champions League finish for two years straight now, costing Luis Enrique his job after one season. When De Rossi signed the extension, he implied that Enrique was a huge reason for wanting to stay with the club despite the offers from Spain and England. De Rossi himself hasn’t been at his best. Injuries and a slight case of being a tad overweight have seen him look less influential and mobile in the middle of the park, not managing to add too much to his team’s attack, scoring only six goals over the last two seasons. Maybe it’s also the pressure of seeing Francesco Totti looking closer to retirement than ever, knowing that he becomes the face of this club, for better and for worse. Maybe the lack of recent success; the changes at the managerial position (Zdenek Zeman returning to the club) and the pressures of being Roma’s numero uno are pushing De Rossi towards foreign shores. His Euro so far has been much better. Applied somewhere between centre back and defensive midfielder in the first two matches, De Rossi did a great job in stopping attacks and helping Pirlo with the build up play. A good tournament in retrospect might re-ignite his hunger for success with Roma, the only club he’s ever played for, or it might just increase the interest in him from Premier League clubs.